What Is Afib with RVR? Afib with RVR refers to atrial fibrillation with rapid ventricular rate. Usually the heart is like clockwork, the top (collecting) chambers beat then the bottom (main pumping) chambers sense this and also beat, and so on, in a nice regular fashion just like a clock ticking second after second. Usually the heart beats at about 60-80 beats per minute. In Afib the top chamber basically goes crazy often firing off over 400 beats per minute! Luckily the bottom chamber doesn’t allow all those impulses through but it does let every second or third one through. This can give a heart rate of 100-180 beats per minute at rest, still too many beats, known as Afib with RVR, leading to symptoms and problems with heart function. Afib does not necessarily lead to Afib with RVR however, Afib can be rate controlled, sometimes naturally, sometimes using medications and sometimes requiring procedures as discussed below. What Are The Symptoms of Afib with RVR? In most people with AFib although symptoms can sometimes be unpleasant it is generally not harmful. The main concern is stroke, but that can be treated with the use of blood thinning medications in people at risk. In Afib with RVR, basically the heart is beating too fast. 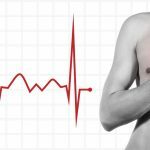 Of course palpitations (sometimes described as heart flutter) are the most common symptom. Other symptoms of AFib with RVR may include dizziness, lack of energy, exercise intolerance and shortness of breath. If Afib with RVR goes on for too long then this may result in heart failure and of course worsening of existing heart failure. Control of the heart rate in patients with Afib with RVR often causes these symptoms to improve. 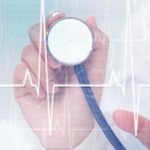 This is known as cardioversion and is used typically either when an immediate result is required or used when the Afib is of relatively recent onset or only intermittent, and so has more chance of staying in normal rhythm. In cardioversion a small shock is given using defibrillation pads. It is done under light anesthesia therefore it doesn’t hurt. The Afib may return however. The biggest problem in Afib with RVR is too fast a heart rate. In a rhythm control strategy we use drugs such as beta-blockers to slow the heart rate down. These drugs typically will leave the patient in AF. For many people with AF it turns out that a rate control strategy is preferred as it is considered less risky than the rhythm control drugs used to get rid of the AF while being just as effective. In Afib with RVR rate control drugs can often slow the heart rate down fairly quickly and improve symptoms. These medications are generally more powerful than the rate control drugs and attempt to convert the Afib back in to a normal rhythm. They are often given after a shock treatment to try and help the heart stay in normal rhythm. These drugs are also commonly used in hospitalized Afib with RVR patients. The problem with these drugs is that they may have side effects and associated risks. Many patients simply cannot tolerate Afib even if the rate is controlled and therefore require rhythm control drugs. They may be safe and effective however if used in selected patients. In cases of Afib with RVR these medications may need to be used if patients cannot tolerate other rate control medications. Ablation procedures are minimally invasive procedures typically done through the groin. They are typically used in patients that have tried, or cannot tolerate medicines for control of AFib. Ablation is typically not used as an emergency treatment of Afib with RVR, rather it is used for stable patients in AF, or those with intermittent AFib that wish to remain in normal rhythm. In patients that have had persistent Afib for a long time these procedures are not likely to be successful in the long term. This is typically the last throw of the dice for AF control. In some patients, drugs can either not control the rate in AFib with RVR, or the drugs can simply not be tolerated. In these patients who have no other choice, and in whom it is determined the Afib is causing harmful effects, a procedure called AV node ablation and pacemaker is done. In a relatively minor procedure, a small burn is made to the connection that connects the top and bottom chambers of the heart. A pacemaker is then inserted. This prevents Afib with RVR as although the top chambers continue to fire at a fast rate, the pacemaker now controls the bottom chamber, in a nice regular way. The downside of course is that now although the patient cannot have Afib with RVR, they have a pacemaker. These descriptions were so clear. I’ve previously had some episodes of afib controlled with Cardizem. This last one was different, and my PB dropped so low that they couldn’t administer the drug. The doctors seemed so much more concerned than previously. I just saw on a report that it was afib with RVR. No wonder it was a bigger deal. Thank you for including the info about the risk of heart failure involvement. My husband repeatedly had afib for about 5 years before he was stopped in his tracks with it. Then he went to a cardiologist. He did a stress test and admitted him for a cathaderation which ended up finding the aorta over 80% blocked. The doctor was able to stint it back to a 60% blockage and said that was as much as he could safely do. He told us there are also another 60% and a 40% blockage that he could do nothing about. Then, at the 2 week checkup his heart rate was 194 – blood pressure normal – he was again admitted to bring his heart rate down. The second night his heart rate went to 20 three times, the nurses came in and woke him up, he had no idea, no pain, no symptoms. The next day he got a pacemaker. Now, two days ago his heart started racing again, pulse around 135 and it could not be lowered at home so after 12 hours he finally agreed to go to the doctor who told him he was in afib, and hospitalized him. After 24 hours they transferred him to a larger hospital saying they were going to do another catheradation, to see if they could determine what’s wrong. Today they offered him a nuclear stress test instead. That may happen on Monday. At this time I am confused and worried. Is the doctor thinking he can do no more for him? Hubby is overweight and smokes, but his cholesterol is “good” so he thought he was doing well. Smoking and overweight are both independent risk factors for heart disease. Having a good cholesterol is almost meaningless if you smoke because the damage to your vasculature is happening anyway. He needs to stop smoking, try the DASH diet or similar, get his weight to normal, and under the supervision of a doctor start doing some light exercise if he wants to live much longer. 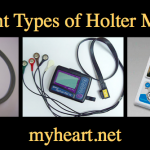 Did you have the symptoms while wearing the holter monitor? I believe you may have mitral valve prolapse. This is very common in women. You may feel as though you are having an anxiety attack, which many doctors will diagnose from your symptoms. A good cardiologist will take several EKGS, to catch the abnormal rhythm caused by MVP. Also, an echocardiogram can show prolapse and abnormal rhythms. You need to assert yourself, you know what you feel, and there are a variety of options to treat the distressing symptoms. My husband had his first AFib in 2010 while digging a post hole for a fence and ask for a glass of ice water. He immediately felt his heart and I took him to patients first Who called 911 and took him to the hospital. This is when we learn it was AFib. He’s had 5 more sense then it’s 2016 now. The doctor gave him the pill in the pocket and said take this and you do not have to go to the emergency room. While we were digging and working on a new deck and he got some ice tea and immediately felt the a fib, on immediately felt the a fib coming on. We went in the house and I gave him one 150 mg propafenone. But my husband said no Iam suppose to take all four. I wasn’t sure so I called the pharmacy he said just to take a mall I still felt uncomfortable so I called the cardiologist on call he said just to take the all of them so 4 totaling 600 mg he’s never taken this med before. while meantime husband had actually started feeling better with just the one but took the others. In a hour he felt uncomfortable. I took his blood pressure it was 137/74 but heart drags was 194. I said we are going to the emergency room He ask for his shoes and the. Started saying everything’s getting white oh god Bonnie call 911 in minutes his eyes roll in the back of his head his arms shook and the. He was completely still and he started turning gray I was on the phone with 911. I attempted cpr And blew in his month nothing I did it again not knowing the exact way to do it a pushed on his chest and blew in his mouth this time he made moaning noises and. Paramedic was the coming by this time. My husband become alert and ask for a towel because he said he wS sweating. They did his vitals and he was normal. Do you think the meds did this to him? Did he have. Seizure Or was it worst did his heart stop? He’s never hAd this happen the only thing we did different was the meds. He only has a fib when he’s working and he drinks something cold. Only 6 attacks in 6 years. They say he should take a bill everyday I don’t think it necessary for something that only happens once a year what is your opinion this episode really scare me and I truly believe it was the medication the caused it? Thank you. In my personal experience with AFib 9 out of my 10 episodes involve cold drinks. From my admittedly questioable internet research this has something to do with the vagus nerve. I just was hospitalized after an episode of kayaking followed by a snow cone… so I just want to let you know I experienced this work plus cold drink issue also. My AFib with RVR was started by eating ice cream twice. Informative and very easy to understand. If your ventricular rate does not respond to medications, you may need to have a pacemaker surgically installed. A pacemaker is an electronic device that regulates the heartbeat to correct RVR. Pacemakers are most often used for people who have Afib and a slow heartbeat. Well , done . It is explained excellently . I never could call it heart is racing . Though I am suffering from it . Thank you . I passed out at work. It was supra ventricularTachycardia so i has a cardiac ablation done on May 3. But since then i having developed a fib with rvr. Another cardiac ablation scheduled for October 25th. What are my chances of needing a pacemaker?? It all depends on the location and aggressiveness of the ablation. This can be discussed with the EP prior who would typically ask you how aggressive you would want them to be to cure the arrhythmia. In general pacemakers aren’t expected after afib ablations. I was just diagnosed with AFIB. I was admitted to the Emergency room with a heart rate of 185 over 110. That was because I went to one Cardiologist who took me off of Metroprolol. After the Emergency room released me, the hospital Cardiologist gave me Xaltra, and 25mg of Metroprolol. I am overweight, and have a nightly Scotch drink. I know that I should lose weight, but what about the Scotch drink…can I still have it every night? Some people are more prone to afib with alcohol, if you improve without it i would abstain, if not then theres no clear guidance. My mom spent the night in ICU last night do to AFIB with RVR. Her heart rate got as high as 155 and paused at 0 for four seconds, several times. She is 67 years old, isn’t overweight, exercises regularly, has never smoked or drank alcohol in her life, so we are a bit confused and worried. The medication they gave her through IV took an hour and forty five minutes to work, but when it finally kicked in, her heart rhythm became normal. She is being released from the hospital today and will see a cardiologist in the near future. Is it safe for her to be alone right now? We’re really worried about her. Thanks! Of course i cant comment on the specific case without knowing all the details. In general with patients with afib if the rate is controlled and she is not having significant symptoms there is no specific concern. I have been on BP meds for about 10 years now. I am 48yr old female. Overweight, but was on meds prior to weight issue. My father had a-fib(but i dont know specifics and he is passed away) and also TIA’s in his late 40’s and early 50’s, but i always attributed that to his smoking. His mother also died from stroke at 52. I used to take labatelol and then was changed to atenolol which controlled my heart rate and bp fairly well for 1 yr. Then atenolol was increased and again, things were good for just over a year, then HR increased again with some episodes of extreme high rates for a few to several minutes. So was just changed to metropolol a few month ago and my bp has been terrible but HR has been decent. 3 days ago i just had an episode last half hour and went to hospital and confirmed afib svs. It resolved on own without meds in a few hours while waiting on bloodwork results. I see my cardiogist in 1 week. What should i ask? Also my son (6 yrs old) always has fast HR when he has his checkups. Is this Afib svs likely to be heriditary? Thank you all for sharing your experiences. I was diagnosed with Paroxysmal A-Fib with RVR back in 2011 when I walked in to an emergency room complaining of palpitations. I’ve developed this a few years after 09/11/2001 along with sleep apnea as I at ground zero but it was never diagnosed because I had short episodes and every time I went to ER or cardiologist it was never caught. 2011 was the first time I needed to be converted. That’s also when I received a sleep study that revealed sleep apnea. It appears my A-Fib is idiopathic given I’ve had a BMI between 14-18%, perfect cholesterol, perfect blood pressure, and perfect sugar. I exercise regularly, do yoga, and used to run which I am afraid to do now. Other than PTSD and anxiety I have none of the reasons why someone would have A-Fib but I guess it is a very common thing. I find that tension and anxiety can also trigger it. The problem is as soon as I feel a PVC or that odd feeling, my adrenaline goes through the roof and it adds to the problem. What’s worse is it is hard to control through medication. My normal resting heart since my 20s has been between 45-55 (I guess due to exercise) or perhaps Bradycardia is just another sign of heart rate issues. Perhaps bradycardia is indicative of A-Fib (not sure). So taking medication is tricky as I don’t want my resting heart rate to go too low. I take aspirin to keep the blood thin and avoid stroke. I guess I am just trying to figure out how to go on living without living in fear. I’m afraid to do anything or go anywhere. I’m always preparing for the worst. I’m guessing A-Fib with RVR is a pretty serious condition and need attention within 30 minutes if episodes do not stop. What do you all do to try and prevent episodes? What do you do to try an stop an episode? Thanks. 61 year female with AFIB w/rvr, 4 years now. I’ve complex PTSD. I’ve sleep apnea as well. What I do when having an episode. Splash cold water on my face. I’ve only had one cardioversion, over a year ago. Nothing else thankfully. I’m in an episode right now, fast pulse, caused by night terrors, I’ve also sleep paralysis. The nightmares have only recently started causing my Afib w/rvr episodes soon waking. Third episode in two weeks. I’ve been able to control them so far with the above mentioned. Maybe it can help you as well. Interesting on night mere, I woke with a fright last night thinking a horse was bitting my ear.I never remember my dreams but in AF, followed pill in pocket in pocket regime and converted in 3 hrs. I got pacemaker 3 weeks ago then out of no where I felt off collapsed outside went into multiple seizures and chest pains paramedic arrived and I was in afib rvr hospital treated me for seizures then release me later last night don’t know what to do anymore. So frustrated. This article is written very well. I was commenting to my substitute Cardiologist today that some one needs to write a good paper on this. Long story short, female, 62 in June, multiple health issues, on many meds at max dosage, afib ablation, aflutter ablation, 2 cardioverts, 3 med conversions, and today had to schedule a cardioversion plus will start a new med for afib. 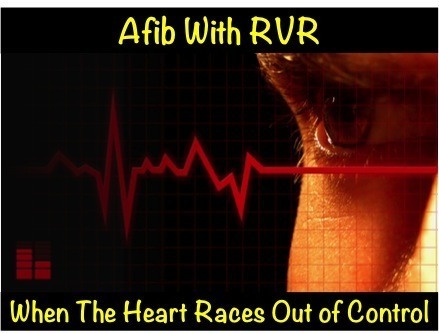 I do have Afib w/RVR and other heart issues. I look at life this way…this is a bump in the road with many bumps. I don’t stress over this diagnosis because I am alive, I can breathe on my own and on most days I can do what I want. My body tells me when I need to rest. If you have to make small changes make them, if you need to lose weight find a way. Get up move, tell someone what is happening but don’t focus on it to the extent you lose friends over it. Your life is your focus..if you want to live it to the fullest you have to make minor adjustment just like you do a car, a sewing machine. If you can find the time to drink a glass of water you can make a small change to improve your life. Hugs to anyone dealing with this or anything other medical issue, mental or physical. My situation is very similar to yours. Two ablations, a cadioversion, medication conversions. It can be stressful, but you you have to take it one day at a time, find balance in your life and keep moving forward. Stressing over it will make it worse. You are not alone. I’m concerned about my situation. After quadruple bypass surgery, I was discharged from the hospital with a heart rate of 260 bpm and told that I had afib with rvr. Home health nursing was provided and I used the machine to send my vitals to the doctor’s office. I was on a number of medications, some are listed in the article and comments section. There were only 4 to 5 hour periods during the day when my heart rate was 70 to 90 bpm. The remaining 19 to 20 hours my heart rate was between 145 and 260 bpm. The nurses at home and on the other end of the machine, persistently appealed to the doctors to adjust my medication. It wasn’t done. My first cardiologist appointment was 36 days after I was discharged. The doctor performed an ekg and immediately sent me to the emergency room for TEE and cardio conversion. Three months later I presented at the ER with chest pains. I was told that my heart was enlarged and it was no longer pumping blood adequately. The final diagnosis is that I need a heart transplant. Is this possible? Thirty six days of rapid heart rate doing so much damage that I now require a transplant? Its not really possible to comment without knowing much much more information. If concerned i would certainly seek a second opinion. Long story short…I’m 44 good shape but I do drink to much caffeine so that’s my trigger. Okay so my question…I’m currently in AFib and Dr today schedule me to come in in the morning for a tee and possible cardioversion. If I’m back in rhythm in the morning it this something I need to go and do?? It depends if you want to have a chance to be back in normal rhythm or not. In most 44 yr olds, if there is felt to be a good chance of restoring rhythm then it may be appropriate to give it a shot. I believe I have this. When I’m having an episode the checker says error every time. One time it actually was able to give me a reading, and it was 192. The pain in my neck is excruciating. As fast as it starts, it will stop. My episodes usually last a couple of hours, and my trigger is usually reaching or bending. I have gotten up in the morning from sleep and be having a spell. My resting heart rate is always at least 110-on a good day! But usually more like 120+. Next recommended step is a monitor. I am 27 years old, was laying in bed and turned to my side and my heart started pounding out of my chest. I sat up and told my husband something wasn’t right. I checked my blood pressure it was 133/79 pulse 120. I stood up and was extremely short of breath and my chest was hurting we went to the hospital which thankfully is 5 minute drive by time I got there my blood pressure was 140/69 but my pulse was 170. They immediately started an ECG and started a IV labs to make sure that I was not having a heart attack and come to find out I had a fib with RVR. I am scheduled to go have an echocardiogram in 2 weeks, but I am feeling better… sometimes a bit on chest pain, nothing to write home about. I am wondering what are the chances of this coming back? Do I need to worry about it happening again? I was told to take A baby aspirin 1x a day. Do I have to tell doctors etc that I have AFib RVR on paperwork? Sorry for the all the questions. Thank you!!! I would certainly tell the dr you had this. In general the recurrence rate depends on many factors and time will tell. Even if it recurs there are good treatment options. I’m in my third year with Afib with RVR. My first hospitalization was when I presented with AFib AND a PE. It is mostly controlled with daily metoprolol, diltiazem and propafenone, but I also have COPD from Amiodarone Pulmonary Toxicity and the second I get any viral infection I wind up in the hospital with the Afib and severe shortness of breath. I have had electroconversion five times but it doesn’t hold more than 24 hours in most cases. I have found a pretty significant trigger to be albuterol, and of course, that is the go to for breathing issues. Breathing issues are made worse by my Afib, which means more albuterol. I am now trying daily use of one of the steroid inhalers, hoping I can avoid the albuterol as much as possible but…. I just got out of hospital after six days of dealing with the breathing/Afib, and am still needing some help from the abluterol. This time I converted after ten hours with IV metoprolol, but had an pretty elevated d-dimmer test so it required nuclear scans before they would let me out. This is getting old. I am not a candidate for ablation, my EP Dr does not feel it will offer me much help, pacemaker isn’t likely to help either as I do get pretty severe symptoms with the AFib and, as I understand it, even if the RVR is stopped I will still have the AFib. While I am labeled as having suffered heart failure last Fall, it was poor record taking on the part of the first ER nurse, but that is stuck right on top of my chart so when I go in with the AFib it is a major emergency to the hospital people, although I know it is not that bad. I have obviously had complete and thorough heart testing and my heart is fine. I am 68, slightly overweight and have been on BP meds for about 20 years but have always had excellent cholesterol.. BP is mostly under control at this point. Also a former smoker but I work full time as a dog groomer so get plenty of exercise. I just had my first episode of Afib RVR 2 days before Christmas. Woke up from my sleep with it. Took the hospital a day and a half to get it to convert back after multiple doses of meds. I am taking baby aspirin and the cardizem they prescribed me has too many side effects. I am truly scared. Any possibility this too was a one time deal? ?